You are here: Home / Everyday Posts / Protein Fight Club! Choose Your Battles! I’ve been on a health journey with the help of my R.D. partner, Michelle Dudash. We are part of a sponsored campaign with Milk. One of the main focuses in my last meeting with Michelle was on protein. I exercise regularly and I know that protein is essential to muscle repair and recovery. Protein also keeps me fuller longer and gives me the energy I need to start my day. At the end of this post… I give you a sample workout that I follow 3 times a week. The result has been a 20 pound weight loss in about 10 weeks. You can do it too! What are some ways I can get protein out side of meat products? This was my main question to my R.D. partner. Michelle was so helpful! She gave me a list of foods that I can use as go-to snacks for protein other than meats. You can find this list in my last post by clicking here. The most surprising item to me on this list was Milk. You might think that I’m a little slow… but I was of the Milk has Calcium generation. I don’t ever remember learning that Milk had protein. It turns out that 8 ounces of Milk has 8 grams of protein. That’s more than an egg! 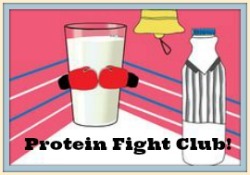 I wanted to share with you my very favorite of the new Protein Fight Club commercials produced by Milk. This one hits home for me because it’s Milk versus breakfast sausage. A meat like this greasy, fatty, breakfast sausage, is not the the way I want to be taking in my protein in the morning. Make the most of your power hours 6am-8am! I hope that you’re enjoying this series as much as I am. Today… I’ve decided to share with you one of my morning workout routines. I do this 3 times a week and I follow it up with a glass of milk to help with my muscle recovery. Join the Fight Club with me! I start with a 1 mile all out run or a 3 mile walk/hike followed by these exercises that are easy to do at home. You can do it! What’s your favorite exercise?